Controlling fluids can be easy by using a solenoid valve. The solenoid valves can be used to close, release, dispense or blend fluids. Solenoids can help switch, swiftly and safely. Solenoid valves are reliable, durable and are made of quality materials. High Pressure Solenoid Valves are designed to withstand a pressure of up to 50 Mpa. It can help regulate and control the flow of gases and liquids, natural gas, Hydrogen and other high pressure gases, flammable liquids and gases. The valve is commonly used in medical, drying and clothing equipment’s, Petrochemicals, bio-pharmaceutical, HVAC, in electrical, mining and food industry, painting, printing and dyeing industries, rubber and machinery. 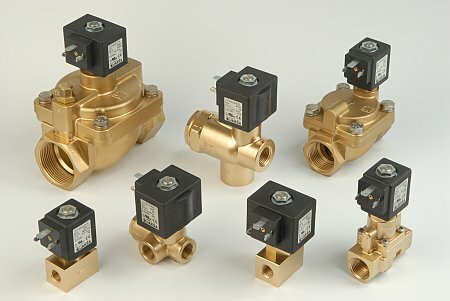 The high pressure solenoid valves are made of Brass or INOX with specifications following AISI 303. The internal parts of the high pressure solenoid valves are also made of INOX, AISI 303 and AISI 430F specifications. Its cap or seals are made of high performance materials which are heat resistant and durable like PA or Polyamide, PTFE, PU or polyurethane and PEEK. The temperature of the fluid that pass through the valve ranges from -10 degrees Centigrade to +100 degrees Centigrade for PTFE, +90 degrees Centigrade (PA) and +70 degrees Centigrade (PU). The environmental or atmospheric temperature of the high pressure solenoid valves is a max +55 degrees centigrade. Its velocity of max 21 square millimeter per second makes the fluid flow easily. Its voltage is 230, 115, and 48, 24 Volts for Alternating Current and 24, 12 Volts for Direct Current. IP65 with plug to ISO 4400 ensures electrical protection. The high pressure solenoid valves operate continuously at ED100%, with a cyclic rate of 10 to 100 Cycles per minute. Its special features and benefits include a zero leakage, bi-directional flow, requires less current and can be handled and operated easily.